For long now I’ve been trying to make something similar to porridge – only grain free. The vegetable ones I’ve tried was OK but never fabulous. 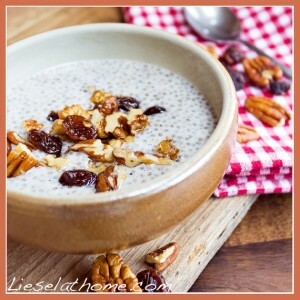 This chia seed coconut porridge with vanilla however is like heaven in a bowl! Both warm and cold, so you can also make it in the evening and eat it directly out of the fridge in the morning. Talk about a fast breakfast! And yummy too!! 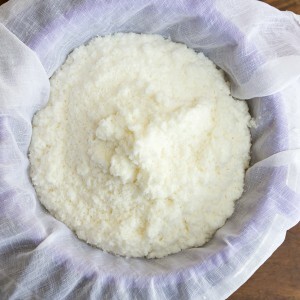 Start by making coconut milk. Now, this is not as hard at it sounds and it is soooo worth it. Cheaper and tastier! You’ll need a blender or a hand held mixer though. Empty 200 g (7 oz. 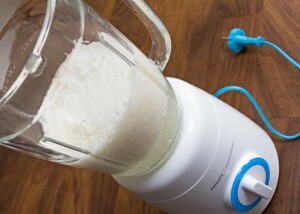 / 500 ml / 2 cup) good quality organic shredded coconut into a blender. Add 700 ml (3 cup) warm’ish water. Blend on high speed for 30 seconds, turn off for 30 seconds and then blend once more for 30 seconds – no need to be exact! Then get the milk out of that mix! 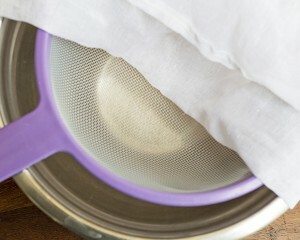 You’ll need a bowl, a sieve (strainer?) and a cheese cloth or a thin piece of fabric. optionally 1 tbsp. (or less) maple sirup. You could add honey or any other sweetener instead but I think maple sirup complements the vanilla best. 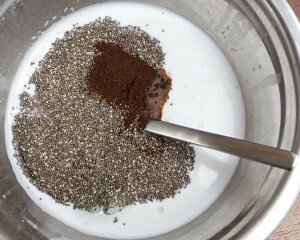 Stir with a spoon or a whisk and then leave to let the chia seeds swell for at least 30 minutes. If you are making warm porridge then keep the pot over very low heat and let the porridge slowly simmer. Place in a pan and heat up. 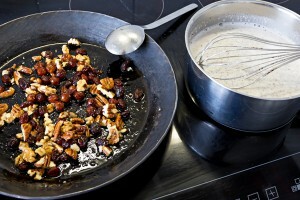 Optionally add up to 1/2 tbsp maple sirup to the nuts, and stir. 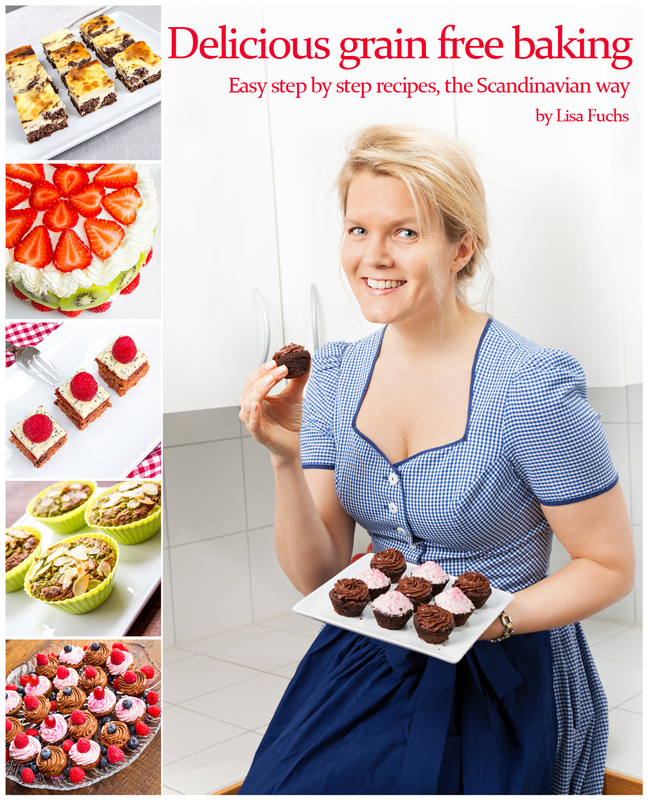 Careful not to burn them – just heat up and coat with the oil, kind of…. 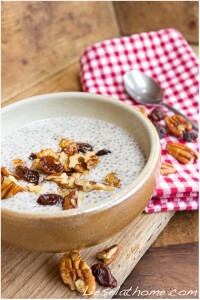 After the 30 minutes are up, divide the porridge between 3 or 4 bowls, top with the nuts and eat warm or warm’ish – or if you did not heat up the pudding, you can now place the bowls in the fridge and leave over night or until you have enough cravings to not be able to resist them any more…. I like to divide the pudding into 6-8 small glasses and serve as dessert as well. Warm or cold – both ways delicious!! ← 3 favorite Ice Teas!